Next Tuesday, Apple is expected to unveil its largest array of new product introductions ever, ranging from iPhone 8—and a premium new iPhone X—to a new 4K/HDR Apple TV, new Apple Watch Series 3, revamped AirPods and the company's new HomePod appliance—as well as its new Apple Park campus. Here's why it all matters—focusing on wearables. A previous segment looked at the "largest" unveiling of the event: Apple Park itself, followed by an examination of Apple's future strategy related to iPhone 8, 8 Plus and X. If you hadn't read AppleInsider discussing the future of Apple Watch last summer, you might have missed our report on upcoming eSIM technology which promised to "enable ultramobile devices like Apple Watch to connect to the user's same mobile account, allowing them to take calls directly over the mobile network." 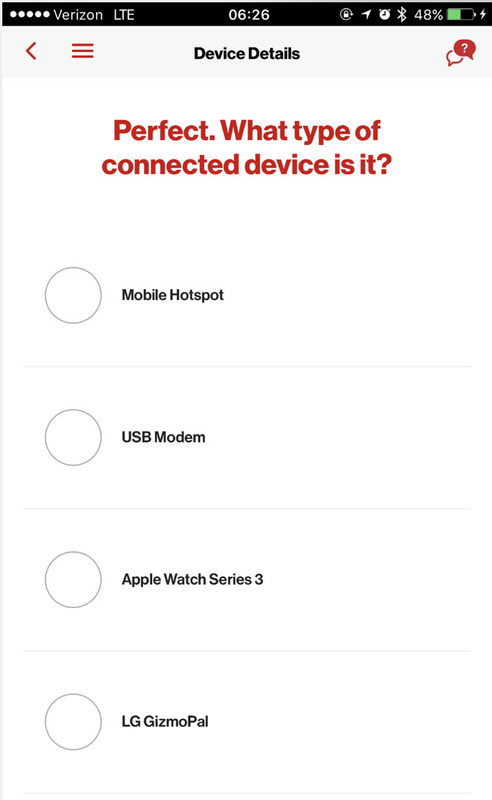 Now that this has been essentially confirmed, both in leaks of iOS 11 detailing an LTE-equipped Series 3 Apple Watch and in a leak by the MyVerizon app (below) offering to configure cellular service for "Apple Watch Series 3," we can breathe easy that the obvious next step for Apple Watch is indeed on the way. There's a lot we still don't know about the upcoming Apple Watch Series 3, but it appears clear that it remains tethered to iPhone, even if it gains the ability to make calls on its own using your existing cellular number. Like the original iPods before it, Apple Watch lacks a large enough display to handle loading apps and other configuration. You'll still use iOS to do those tasks, as Apple Watch is to iPhone what iPod was to the Mac a decade ago. So much for the bizarre, poorly thought out media narrative that Apple is trying to kill the iPhone and replace it with a wearable before anyone else can. I've tried to talk to every Apple Watch wearer I've crossed paths with, and what I've found is that there are lots of very different reasons why people choose to wear one. For some it's notifications. There are many people who work in environments where they are unable to carry their phone. That includes everyone from TSA agents to hospital medics. Having a way to get alerted of messages and other updates is very valuable to them. If Apple Watch turned into a full phone, that streamlined value goes away. Another key reason for wearing Apple Watch is activity tracking. Apple has capitalized on optimizing the upcoming watchOS 4 to handle new kinds of activity, and has detailed its ambitious efforts to study workouts in its fitness research labs. Across the board, no matter what reason users have for putting on their Apple Watch every day, a big factor in how useful it is relates to battery life. Apple made significant strides in improving both responsiveness and battery efficiency in the last update with Series 2. The company now has another year of progress in both software and hardware that should make Series 3 a very compelling upgrade for the original "Series 0" buyers in battery life alone. It is likely too early for Apple to move to new display technology for Series 3. Apple acquired LuxVue last year to own its advanced micro-LED technology, and filed patents on aspects of it this February—including the ability to read fingerprints through the display. The new micro-LED screens could also contribute to major new gains in efficiency going forward, but it is not likely to be ready for deployment yet. Another area Apple can improve upon in Watch Series 3 is motion sensitivity and gesture controls. Third party apps could make practical use of watch gestures to control presentations, robots, drones and trigger other events, such as Home Kit commands, responses to Siri, or hands free interactions with user interface elements. Also, as with the A11 Fusion chip destined for new 2017 iPhones, we don't know much about the CPU (or GPU) Apple will be using in its latest Watch S3 refresh. But based on the speed of chip development in iOS land, it goes without saying that new Watch versions of Apple's previous Ax chip architectures can offer lots of new improvements in both speed and energy efficiency. It's noteworthy that no other smartphone makers share the benefits of Apple's vast investments in proprietary Ax silicon technology, instead being dependent upon generic ARM designs or chips from Qualcomm and other vendors, none of whom earn anything from smartwatch silicon because there's effectively no market for smartwatch silicon outside of Apple. There is also no apparent catalyst for that situation to change in the near future. 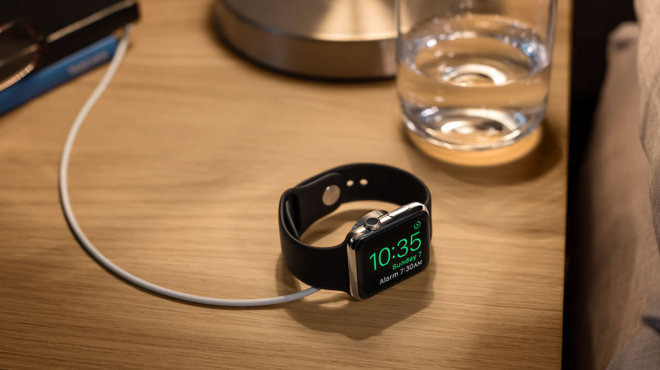 Prior to the original unveiling of Apple Watch back in 2014 and its launch the following year, there were a variety of attempts to introduce wearable computing devices. Beyond conventional smartwatches from Samsung, Sony, Motorola and other licensees of Google's Android Wear platform, there were a variety of activity trackers from Pebble, Fitbit, Xiaomi, Microsoft and others. Google Glass had attempted to launch a wearable for your head in 2013, followed by a demo of Microsoft Hololens in 2015. Just two years later, virtually all of those initiatives are either canceled, stuck as unrealistically expensive demos, or performing so poorly commercially they might be considered irrelevant, with the notable exception of Apple Watch and Fitbit. 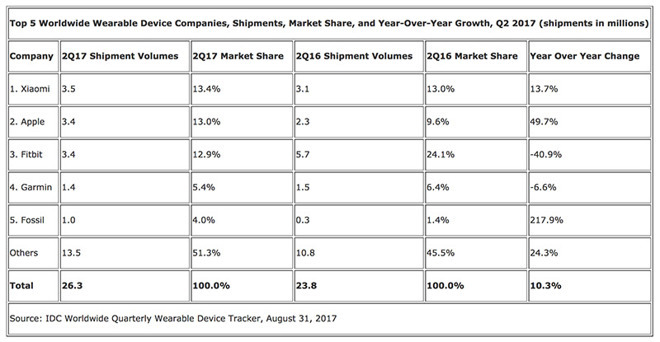 The latest research from IDC estimated that Apple Watch is now tied with Fitbit in units shipped. However, just one year ago Fitbit had double the shipments of Apple Watch (according to IDC), so already falling down to just being tied with Apple is not really a good thing. Fitbit is a far less expensive device (with an Average Selling Price of around $100, vs closer to $300 for Apple Watch), so in revenues, Apple Watch brings in 300 percent that of Fitbit. IDC also likes to throw in Xiaomi bands, which retail between $13 and $25. IDC estimates that Xiaomi is slightly ahead of Apple in wrist-worn wearable volumes, but that's sort of a joke given that Mi Band revenues are close to nothing—a fifth of Fitbit's and around one fifteenth that of Apple's. IDC can claim Xiaomi's roughly $52 million in wearable revenues "maintained its lead in the second quarter," even as Fitbit brought in about $340 million and Apple Watch earned more than $1 billion, but this kind of statistical nonsense is getting hard to take seriously. As other analysts have pointed out, AirPods—Apple's other wearable—indisputably launch Apple into the lead by any metric, unless you begin counting cotton and leather as "wearable platforms" merely to invent a way to pretend that Apple isn't leading the market by a wide margin. Why does Apple lead wearables so decisively, despite all the efforts by various hardware and software companies with years of prior experience? There are a lot of parallels with both smartphones and MP3 music players, with the core reason being Apple's clear advantage in tight integration. Software giants like Google and Microsoft clearly don't really have any capacity to build hardware at meaningful scale, and hardware experts like Sony and Samsung are terrible at software. Apple is not just good at both hardware and software, but is incredibly capable of catching up and surpassing rivals who are only good at one. Samsung claimed an early lead in water resistance on its phones and watches, but Apple Watch caught up quickly and pushed forward with the determination of a motivated quick learner. 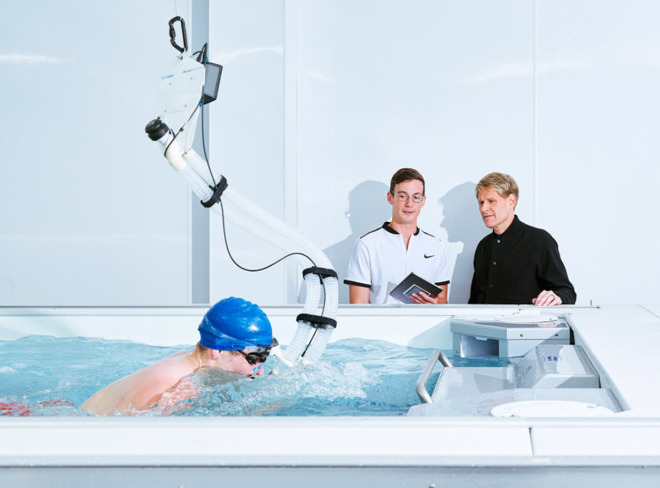 By its second generation, Apple Watch moved from water resistant to swim proof. A key reason why Apple can adapt so quickly is that it actually makes money. Xiaomi's ability to put a small OLED screen on its super low cost Mi Band (less than $25) is impressive, but after it did that work it only generated around $52 million in the summer quarter, with apparently very slim margins. Apple's more expensive efforts to build a much more sophisticated Watch platform you can swim with resulted in over $1 billion in revenues over the same period. Apple Watch also has higher margins—meaning Apple can easily afford to keep innovating to make its products even better. No matter how flashy Google Glass and Microsoft Hololens were, the fact is that effectively nobody is willing to pay $1,500 a pop to fund those companies' future pursuits, meaning that their continued development is a huge risk of capital. Microsoft has already abandoned its slow selling Band, as well as plenty of other product initiatives it claimed it would invest in for the "long haul," including Zune and Windows RT. No matter how much they deny it, companies making expensive technology products that don't make any money can't afford to keep doing it for very long. 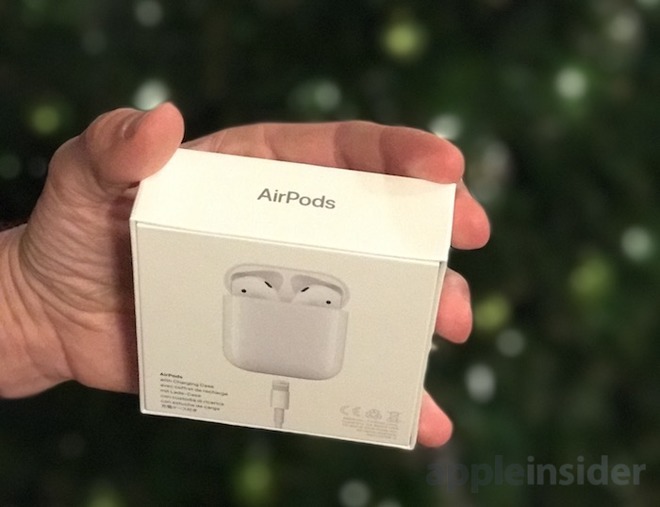 Apple is expected to refresh its AirPods on Tuesday, although the smash hit of the last year hardly needs dramatic updates. Apple has been building AirPods as fast as it can to meet demand ever since it launched the enhanced Bluetooth headphones last winter. Who could have imagined that rather than being emerged in a visual VR experience that required $1,500 goggles and paying for completely new VR content that doesn't yet exist, the mass market would instead prefer to be engaged with immersive audio that augments their reality—while walking, riding transit or running in the park—in a luxurious, futuristic fashion for a far more affordable $159, using music and podcasts they already own or have access to? AirPods are a great example of Apple's ability to target the middle of the bell curve with a broadly desirable product that works well because it doesn't seek to be more ambitious in its features than it can actually deliver. Contrast Glass and Hololens, both of which cost about ten times as much and make rather grandiose claims that they can't really deliver. It's almost as if Apple is fixated with pleasing its customers while Google, Microsoft and other competitors are out to impress the media. The media is often quite easy to impress because journalists so rarely ask hard questions and don't seem to care about revenue, profitability or the future capacity to support the claims generated by public relations. It's all about the impressive demo, and whether they feel they're seeing "innovation," which is so often interpreted as pure novelty rather than a practical product with real potential for sale at a realistic price in sustainable volumes. Remember how enamored the media was with Palm webOS, Nexus, Glass, Pixel, Surface, Hololens and now Essential, without ever stepping back to think about how any of those things could possibly survive in a competitive market? It's almost as if Apple has a monopoly on critical coverage! On Tuesday, Apple will offer more details on its immediate plans for wearables. One thing is pretty clear: we're not a year or two away from ditching our smartphones for VR goggles, no matter how much that narrative offers some hope for Apple's overwhelmingly dominate lead in wearables to be challenged. More likely, we will see continued advancement of Apple Watch and AirPods as peripherals of the current model of personal computing, centered on iPhones running apps. Even as those wearables allow us to leave behind our iPhones momentarily—playing phone-free tunes from your Watch via AirPods while out on a run, or taking a call, or asking Siri for directions or other information without carrying a phone—they still require a configuration interface that for now is based on a conventional phone with more battery and processing power than can currently fit in a Watch. However, a number of things are changing as technology develops, including integration with our cars via AirPlay and our homes with Apple TV and HomePod, the subject of our next segment.